Today Is My Favorite: Listen Little Children. Don't Drop Your Computers. Listen Little Children. Don't Drop Your Computers. It's a sad day when my stupid, boney ankle pulls the computer with the charger from the counter to the hard kitchen floor. Stupidstupidsad. Lucky for me my sweet mother-in-law-in-town-for-Easter is kind enough to lend me hers for the night. Do you know what a bluthering idiot I become without my keys and screen!? Sad, but true story. Maybe I actually need the technological break!? Our Easter Day minus one was a happy loud mess of 30 people, several dozen dishes of food, over 600 eggs and about 100 loud happy laughs all crammed into our house. There were lilac bunches in my collection of tiny vases. Colored bowls of jelly beans. And a whole lotta love. It's really just the way I like my holidays. Loud, happy and fattening. Easter morning found our whole big family taking up the entire row. Including Husband's parents flown in from California. We ate -- no duh. Walked around in the sunshine. Enjoyed one matinee movie and a bucketload of popcorn. Then it was dessert back at the family's house. Literally the most perfect happy day in a really long time. Now wish me luck that my computer get fixed soon. That the jelly-belly around my middle is soon gone. And that my awesome father-in-law fixes all the broken walls in our house before they go home tomorrow night. Happy Day to you, Lovelies. You literally kind of rock for rising from the dead. Thanks for giving me a reason to live. 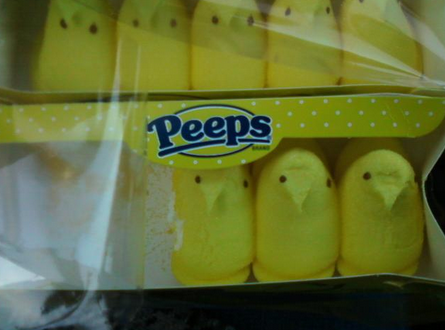 Feel free to send all the uneaten, discounted Peeps you can find. I've not quite had my fill. Sounds like an amazing Easter - the best ones are always surrounded by family! the SAME thing happened to me!! :P my computer is now DEAD. ): hope yours can be fixed! Sounds like a great day. Check this out: https://pinterest.com/search/?q=peeps+s%27mores. Hope your computer comes back fixed and ready to go! Girl! What an amazing Easter break! "Loud, happy and fattening" (I may be stealing that one! :P I am sure that it will all work out! If you have 2 min, I cordially invite you to check out my recent trip scrapbook.